543 sailors from 50 nations are racing on Biscayne Bay, just off Coconut Grove in Miami, Florida, USA. Two more days of competition remain with Medal Races on Saturday 27 bringing the first major event of 2018 to a close. “We had a tight Regatta in the Rio 2016 Olympic Games with Jason and Lisa and I admire them a lot. “For the last six races we were neck and neck and I do love it. 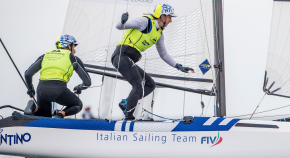 It’s what makes sailing enjoyable but we look forward to catching them up tomorrow,” said Lange. 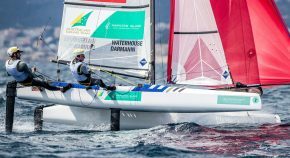 The bronze medal skipper from 2016, Thomas Zajac (AUT) is sailing with a new crew in this Olympic cycle, Barbara Matz (AUT). While the consistency hasn’t been where they would like to see it, the new partnership has shown plenty of potential, winning one race and finishing second in two others. 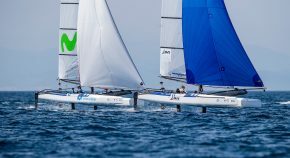 For most of the 21-boat 49erFX fleet, which didn’t start a race until 14:40, when the wind and waves were peaking, today’s conditions proved to be too much with only one race completed. “Sailing downwind was the biggest challenge and keeping the boat upright was difficult,” said Victoria Jurczok (GER). With challenging conditions, yesterday’s leaders, Sime and Mihovil Fantela, drop to 19th place. However both Spanish teams in the fleet have used today’s strong winds to climb up the table.